Far North Yarn Co. is the yarn shop you've always wanted to visit. 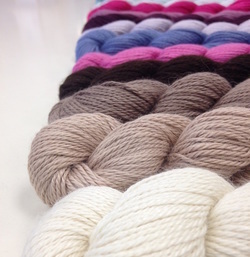 Offering a broad selection of classes, fine yarns and room to socialize, FNYC is the ideal knitting shop. We are a locally owned family business, passionate about providing quality products and service to our knitting community. Kay's lifelong passion for knitting led her to open her first yarn shop in 1981 in Northway, Alaska. Through the years and many moves around the state, her small shop with its humble beginnings has grown into the business you see today. Joined by her daughter Annie, FNYC is complete.